Fig. 1-3-2-10 shows the numbers of persons newly received by public prosecutors offices for violations of the Trademark Act (Act No. 127 of 1959) and the Copyright Act (Act No. 48 of 1970) over the last 20 years (See Appendix 1-4 for the number of persons newly received by public prosecutors offices for violations of the Patent Act (Act No. 121 of 1959), the Utility Model Act (Act No. 123 of 1959), and the Design Act (Act No. 125 of 1959) over the last 10 years). 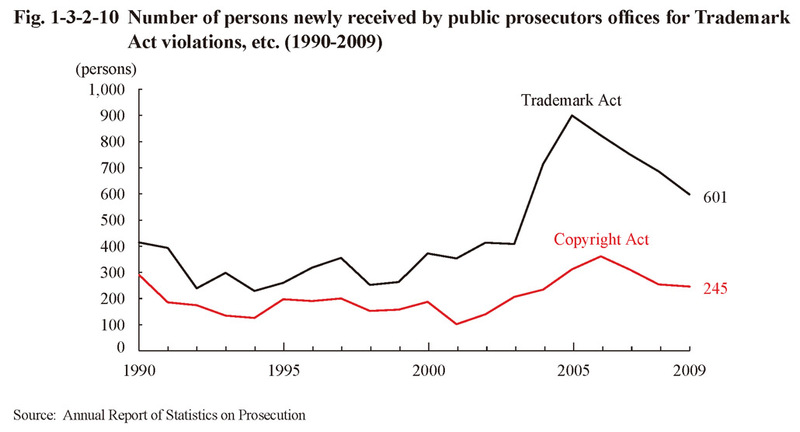 The number of persons received for Trademark Act violations increased sharply from 2004 to 2005, but then continued decreasing every year from 2006 on. However, it then remained at a high level and was 601 in 2009. The number of persons received for Copyright Act violations increased every year from 2002 on but then continued decreasing from 2007 on. It also then remained at a high level and was 245 in 2009. Table 1-3-2-11 shows the number of persons prosecuted or not prosecuted for violations of these acts over the last five years. See Appendix 1-6 for the sentencing for financial and economic offenses, described in this chapter, in a court of first instance between 2007 and 2009.